Helen was always very nice to me, even after I married and moved away. I never saw her from about 1962 till 2006, but she always sent lovely Christmas cards and a small, appropriate gift. I mention appropriate, because some distant relatives become jokes for their poor taste in gifts. Helen always seemed to get it right- a box of assorted fancy mustard, jelly, fruit. It wasn't always food, but I don't want to make up stuff I don't remember. I just remember that she never sent a "loser." I visited her in 2006, and would love to show you a picture from that trip, but I can't find them (grrr- not digital?). 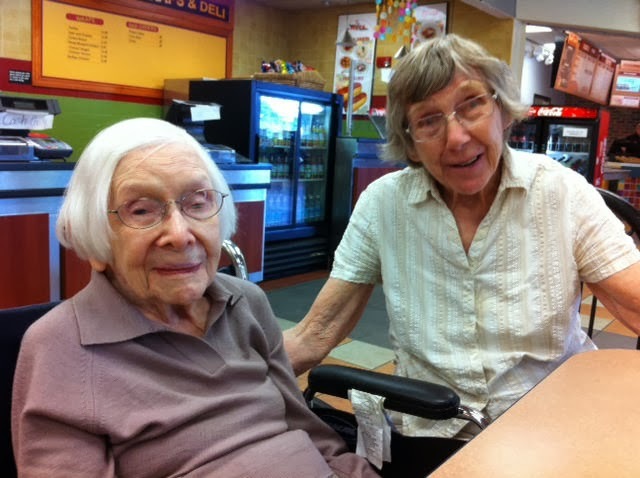 Anyway, Jean sent me a picture taken just last fall, with Jean's mother. 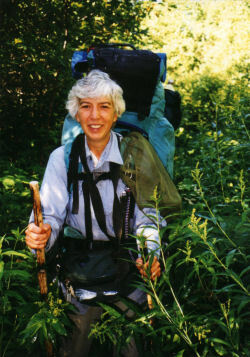 Helen is on the left. I never can figure out how these people get old. Here is how I remember Helen. She's on the right, and I'm the munchkin. 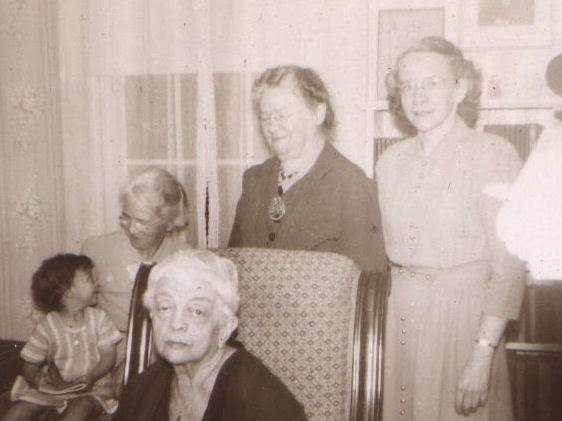 The woman holding me is Mary, great-aunt to Jean, and cousin of my grandmother. Next to her is her sister Mabel, Jean's grandmother, also cousin to my grandmother. In the front is Winifred, wife of a deceased sibling, Percy. Helen is Mabel's daughter, and her brother was George, Jean's father. Another sister, Grace died a few years ago. It's all very confusing when written out that way. Mabel, Mary and Percy are siblings. My grandmother is their cousin. Helen, George and Grace are Mabel's children. Jean is George's daughter. I actually remember pieces of this trip. The house was on Long Island. Jean remembers the house better than I do. She was there more often, but my family never went again after this time. I have no idea why. Jean says the house is gone now, too. Very soon, I will be the only person in this picture who is still alive. How did that happen? The march of time; the destiny of all men. And women. Cool story. You mother's second cousin is you second cousin once removed. Second cousins share a common great grandparent. Third cousins share a great great grandparent. The "removed" means that there is a different number of generations between the individuals and the common ancestor. that's quite a milestone to celebrate. Winifred looks positively thrilled to be there. Hahahaha! I'm not sure how old the oldest family member is. She is the wife of one of my father's uncle's, who passed away when I was very young. Up until the last few years she used to be very active and drove herself around and would attend church, volunteered at the local hospital, etc. but now she's much more limited. She doesn't drive, although still lives alone. She even traveled down to North Carolina to see one of her grandkids get married this past summer. The Shroud of Turin- What Do You Think?